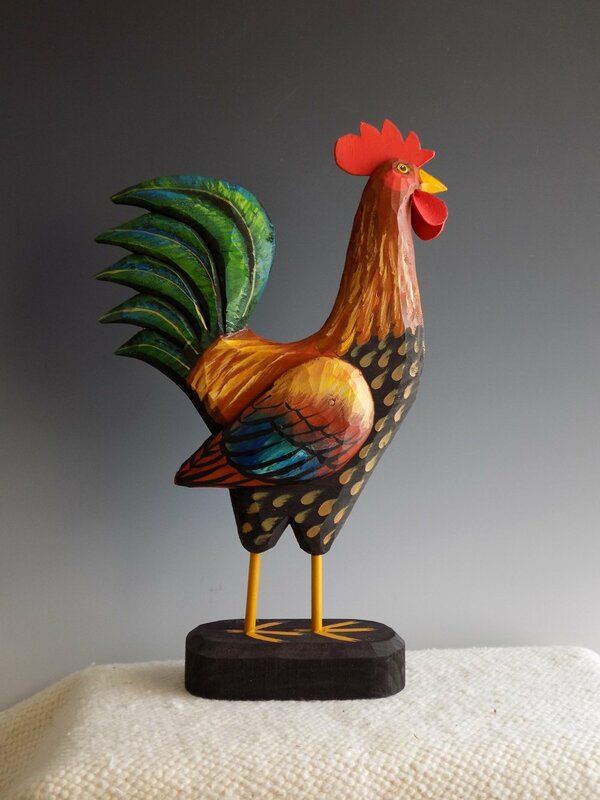 Carved White Pine , Acrylic Paint, Wooden Wings, Hardwood dowel legs, Leather feet, Leather comb and wattles, Mounted on Pine base. Dimensions: 12 in Long, 10 in Tall, 6 1/4 in Wide. Carved White Pine , Acrylic Paint, Hardwood dowel legs, Leather comb and wattles, Mounted on Pine base. Dimensions: 9 in Long, 10 in Tall, 3 in Wide. Carved 3/4 in White Pine , Acrylic Paint, Metal Rod Legs, Wire Legs Mounted on Rooster, Chick with Leather Wings, Mounted on Pine base. Dimensions: 9 1/2 in Long, 17 1/2 in Tall, 4 1/2 in Wide. Carved White Pine , Acrylic Paint, Hardwood dowel legs, Mounted on Pine base. Dimensions: 5 1/4 in Long, 7 1/2 in Tall, 2 in Wide. Dimensions: 8 1/2 in Long, 13 in Tall, 2 1/2 in Wide.